Welcome to the Cultural Synergies June 2008 newsletter. In recent weeks I have been doing some work in China. On my return flight from Beijing I took a moment to reflect on the project I had completed as I habitually do. As I was musing over my current China experience I began to reflect on the first trip I took to China over 11 years ago and some of my first Japanese experiences. The different cultural preferences for presentation styles came to mind. My early days of working in these countries were a huge learning curve. As I had done a lot of presenting within Australia prior to embarking on expanding into the Asian markets, I believed that it would be a similar experience. I had my presentation �formula�; I had my materials, slides, presentation style and it all worked very well. My strategy was to take this formula to overseas countries and produce similar outcomes. Well it didn�t take me very long at all to realise that my Australian approach was in need of some tweaking and rethinking. For example my slides were designed for the Australian market - bullet points, key words and not too much detail. I liked, and still do in the right context, to talk through the points and encourage discussion. I didn�t include too much in the way of handouts because my perceptions of the �Western� way is that often less is more and participant interaction and discussion is a more successful means of ensuring comprehension of content. Japan particularly came to mind as a stark contrast to presenting in the West as I was having my reflection time on my long flight home. At the time I thought I was prepared and understood enough of the cultural differences to anticipate some of the challenges that I would face. Rather quickly I realised my Japanese clients wanted and expected a lot of written material and hand-outs that they could take away with them. They favoured the less interactive style in preference for more directive, visual, almost lecture style presentations. In the early days I had a couple of confronting moments when my workshops were met with a lot of silence, poor response to my humour and a clear reluctance to engage in discussion. I could have interpreted some of these responses as a lack of interest and understanding of the content. Luckily for me I am thick skinned and I was aware enough to acknowledge that perhaps it was my presentation style that needed some careful consideration, rather than focusing on the �difficult� participants. Language is probably the most obvious factor that needs to be taken into consideration when presenting in other countries. Often I find that it is the more subtle differences surrounding hierarchy and equality, high and low context that require close attention. For example people from hierarchical cultures such as Japan and China are not as inclined to engage in public discussions and to raise topics of concern when they are sitting in a room filled with their managers and colleagues. One of the strategies that I developed early was to establish some processes that are always put into place prior to a project. One of the critical pre-works that you can do is to send a pre-workshop letter to all participants prior to the commencement explaining to them that all responses will remain confidential. Pose some questions and invite comments for issues of concern. This way you can address concerns in a less confronting manner by including them in your talk. It is also important to gather feedback and ask if there are any unresolved questions or issues from participants via email or telephone after the completion of the presentation. This can be particularly useful when some participants are not so inclined to raise questions in the more public forum. Also informal one-on-one discussions during breaks and before and after sessions can be useful. Often even smaller breakout groups can be very productive, especially if teams are mixed so that managers and staff are not in the same team. It is important to solicit feedback in order to continue to tune and refine the content and style of presentations for the future. Whether we are presenting to or working across cultures, we are in a constant state of learning and it is this mode that makes working so much more interesting, exciting and motivating. 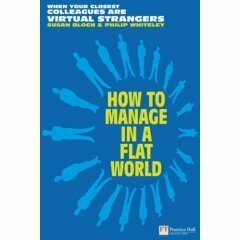 How To Manage In A Flat World: Get Connected To Your Team � Wherever They Are: Susan Bloch & Philip Whiteley: Prentice Hall Financial Times, 2007. Following on from Thomas Friedman�s book 'The World is Flat�. Bloch and Whiteley�s book focuses on how to manage and lead in the ever-changing flat world. The book has 10 clear strategies for managers to improve their performance. They argue that building communicative teams in a multidimensional culture is the key to managing in a flat world. It is a well-researched book that has been developed through interviews and questionnaires from a range of managers across the globe. Apart from the content I also liked the writing style and layout of the book, making it an easy to read book that has some great stories and strategies.